Benton Irrigation District serves over 4,500 acres of urban and agricultural land around Benton County in southeastern Washington. Over the last decade, BID undertook a $35 million project to convert its open-ditch system into a fully pressurized, completely pipe-based system. This technological leap has resulted in significant advances in water conservation. 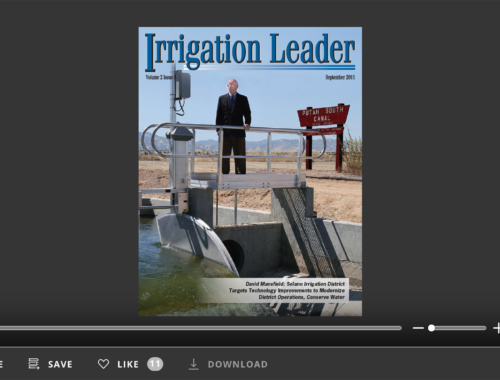 Kris Polly, editor-in-chief of Irrigation Leader, spoke with BID Operations Manager Ed Mitchell about the district’s history, challenges, and recent accomplishments. Kris Polly: How many years have you been with the district? Ed Mitchell: Since 2002. In November, it will be 16 years. Kris Polly: Please tell us about your background. Ed Mitchell: I began my career as a heavy equipment operator, and that moved me into working for a company that built gas stations. I did that for about 15 years, and that led into electronics and training all over the country for the programming and troubleshooting of electronics in service stations. Then I came to work for Benton Irrigation District, where I have been for 16 years. Kris Polly: Where are you from originally? Ed Mitchell: I am from La Grande, Oregon. Most of my family worked for the railroads. My uncles and grandfather all did that. I think back then the railroad in La Grande was the Union Pacific. Kris Polly: Please tell us a little bit about Benton Irrigation District. How many acres do you service, and how many people do you deliver water to? Ed Mitchell: The district was organized in 1912 and made its first water delivery in 1915. We have 4,630 acres and just over 1,700 deliveries. We also service the city and outlying areas. Approximately 50 percent of the district is urbanized. 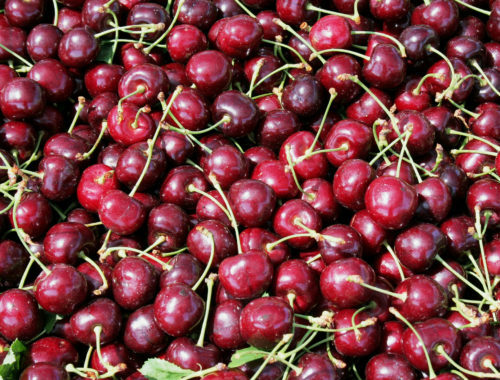 Our primary crops are cherries, grapes, and apples. Kris Polly: Is it a Reclamation district? Ed Mitchell: Yes, it is. 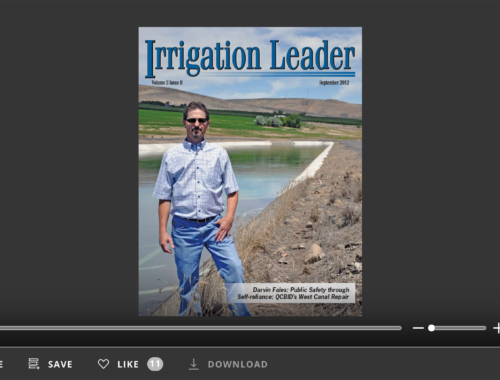 Kris Polly: How many employees does Benton Irrigation District have? Ed Mitchell: We have two full-time service people, including me, and a part-time office manager. The office is in Benton City as well. Kris Polly: What are your top issues? Ed Mitchell: We just installed a pressurized system. We were all open canal when I first started, with approximately 20 miles of open canal. In 2009, we started construction on a pressurized system with the aim of going fully pressurized. We completed that in 2014, with an approximate cost of $35 million and 63 miles of underground pipe. We no longer have any open ditches. 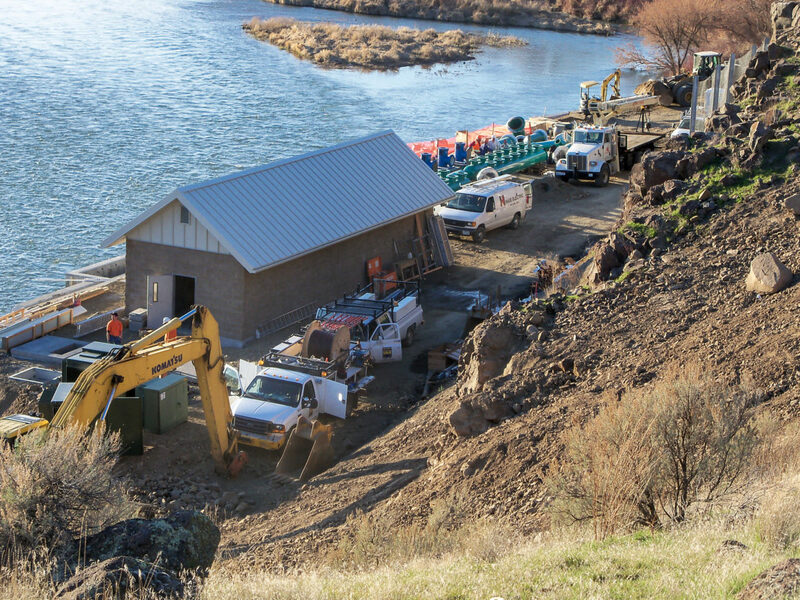 We have one main river pump station that has three 700-horsepower pumps and three 400-horsepower pumps. We also include three booster pump stations because of the elevation here. Kris Polly: Do you have a direct pressure system? Ed Mitchell: Yes, it is a direct pressure system; we have no open ponds. The whole district is fully pressurized. Tanks and ponds were considered by the engineers, but we decided that the pressurization coming from the pumps was the better route. 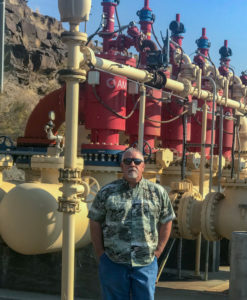 We pump directly out of the Yakima River. It is a state-of-the-art pump station: We have variable-frequency-drive pumps, fish screens to address environmental concerns and keep the fish safe, and self-cleaning filters. It’s an impressive pump station. That alone was $6.5 million. We had to come up with 17.5 percent of that. The Department of Ecology paid for 17.5 percent and the Bureau of Reclamation kicked in 65 percent. For a little district, 17.5 percent of $35 million is still a pretty hefty price tag. Kris Polly: So your irrigators have water on demand? Ed Mitchell: Yes, it is completely on demand. They can turn it on and shut it off any time they want it. In the past, a lot of the larger farms had to call in and give us 24 hours’ notice to regulate the ditch; otherwise, we would overflow. We had a lot of conveyance loss in the old canal. The water conservation with the new system is incredible. Kris Polly: What is the diameter of pipe at your pump station, and what material is the pipe system made of? Ed Mitchell: We have two 36-inch pipes leaving the pump station and one 24-inch pipe leaving the pump station. Most of it is PVC, but we do have some rocky and steep areas, so some of it is ductile iron. Kris Polly: What brand are your pumps? Ed Mitchell: Floway, and we have U.S. motors driving those. The variable-frequency drives that control the pumps are made by Eaton. It is all pressure regulated. When multiple people turn on their pumps, the pressure will drop, so the pumps will ramp up, and vice versa when they shut off. It is a pretty state-of-the-art system. What is nice about it, too, is that I can control the pump station from my cell phone. With the old system, any time the wind blew we would have to come out and clean the weed racks. Now it is all electronic and remote controlled. Kris Polly: What are the top concerns that the district is working on? Ed Mitchell: The main concerns are the river flows and Asian clams, which are an invasive species. Their eggs get into the system and hatch, so we have to continually flush the system and run filter systems to keep them out. Compared with zebra mussels, which get attached to pipes, we’re lucky only to have Asian clams, because we can flush them pretty easily. However, they can plug up a small line— they can get up to 2 inches in diameter, if you let them. Kris Polly: Have there been any other recent changes at Benton Irrigation District? Ed Mitchell: One of the new things with the pressurized system is that we signed a contract with the government giving us 69 percent senior water rights, which is huge for us as a small district. Kris Polly: How much water do you think you save by having an enclosed system? Ed Mitchell: Well, we need at least 60 cubic feet per second to keep our canals full and make our deliveries. In 2017, we only used 57 percent of our allotment. That is all because of water conservation. Kris Polly: What are you doing with the rest of your allotment? Ed Mitchell: It stays in the Yakima River to sustain fish habitat and river levels. Our yearly contract is 15,623 acre-feet. Kris Polly: Was that part of the deal to have the Bureau of Reclamation provide financing? Ed Mitchell: They wanted to take our conveyance loss from our old system, so we did give up some of our conveyance loss. Our allotment is smaller now, but we conserve a lot of water now that we have eliminated the evaporation and leakage we experienced with our open-ditch system. Kris Polly: You mentioned concerns about river flow. What in particular concerns you? Ed Mitchell: The river can get pretty low around here during drought times. Some of the districts that do not have senior water rights actually had to shut down during part of the season a few years back when the water was too low to make deliveries. We were still able to make deliveries at that time, however; our pump station is on an excellent part of the river. Drought is still a concern, though. If the water level drops below our intake structure, we obviously would not be able to pump. We have to keep a close eye on the other districts and what is happening with the river. Kris Polly: You have been an irrigation district manager for over 16 years now. What is the most important thing you have learned? Ed Mitchell: The need for clean, reliable water.